When Taystee’s case was taken on by the ACLU, Orange Is The New Black gestured to the larger world of its story: the riot became national news, and Taystee’s case has galvanized the racial injustice that lies at the core of it. But then that story effectively disappeared: we never learned more about the strategy for the trial, or about how the public was responding to it. When we eventually see the trial at the end of “Well This Took A Dark Turn,” we see people seated on Taystee’s side in support, but we know nothing about them. All we see of the trial is Cindy’s betrayal, and Taystee’s tearful realization that her friend is helping put her away for life. Whatever else is happening in the trial is, ultimately, not part of this narrative. 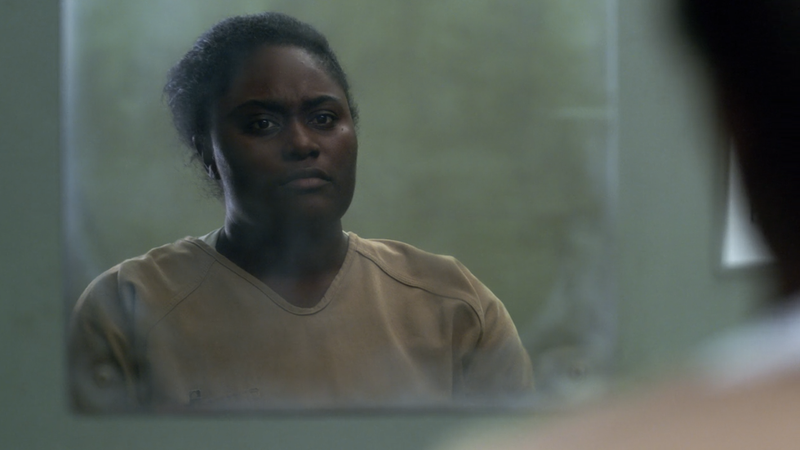 "Well This Took A Dark Turn"
I understand why the show would focus on the personal stakes of the trial: Danielle Brooks did the best work last season, and Adrienne C. Moore has been tremendous working through the guilt of having sold out her best friend out of her own self interest. But the show does a disservice to this story by limiting it to this particular thread, and ignoring the broader implications. This kind of selective storytelling is a necessity in such a large ensemble, I understand that, but this season has struggled to shake the sense there is a far more interesting show that we’re ignoring because the show has to spend time on Carol and Barb and the rest of the chaos of Max. This is no more apparent than when “Well This Took A Dark Turn” ends not with the climax of Cindy’s betrayal, but instead with Ginger’s desperate move to win the inmate lottery by moving Barb and Carol into the same Ad Seg cell, as though that story is the one that pushes us forward to watch the next episode. This is not a new problem for the show, to be clear. Just look at the story of Sophia Burset, who reemerges here for the second time this season despite having, allegedly, been chilling in Florida this whole time without having never actually been glimpsed in any scenes set in B Block to my recollection. The show never entirely explained why it shuttled Sophia’s story to Max: we can read it as a production decision tied to Laverne Cox’s limited availability, or we can read it as a story decision tied to the show’s struggle with how to tell a nuanced story about a transgender inmate while also balancing a dozen other stories and the show’s attempt to straddle comedy and drama. Whatever the reason, though, the result was that a vitally important story the show got credit for starting never really finished, and it returns to here only in relation to another story as Caputo looks for ways to compromise MCC’s public image to aid with Taystee’s trial. Sophia ending up trapped between Caputo’s promise of justice and Linda’s promise of financial compensation and hints at an early release (that she doesn’t seem to have gotten in writing) would be far more compelling if there was any buildup to it, but the bigger issue is that the larger stakes are ignored. The lawyer mentions “precedent” multiple times in their conversation, but at no point does the show explicitly note how this lawsuit would speak to the treatment of transgender individuals in the prison system. 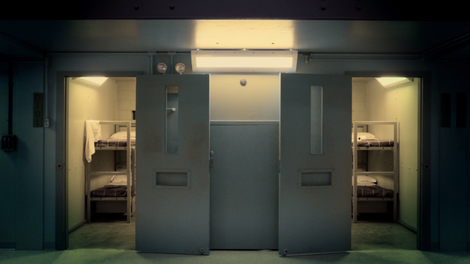 I’m not suggesting that Sophia should be judged for making the “selfish” decision by taking the settlement and supporting her family instead of helping Taystee: frankly, I think that’s the right call, given the unlikelihood of justice prevailing in a broken system (especially when consumed by the futility that has defined her and other marginalized inmates). But it was weird to me that Caputo was so focused on how Sophia should do this to help Taystee, and not the other inmates like her across the country. The history of Sophia’s story was present in the scenes, but they were never amplified, as though the show has forgotten their true weight and is instead referencing them in shorthand so as to give Caputo’s strategy a face we recognize. But that reduces Sophia’s story, and only reinforces how much the show dropped the ball in telling it to its fullest potential. In general, this season has been defined by stories that have inherently limited potential: I don’t think the show has done a terrible job telling any of the stories introduced this season, per se, but too few of them have enough runway to grab my full attention. When Carol and Barb’s feud pulls in Red and Nicky, it has weight, as we see when the latter talks her way out of a dangerous situation after derailing Barb’s hit on the salon. That scene is tense and exciting, but when they throw Carol and Barb in a cell together my only reaction is relief that we might be reaching the end of that particular saga. The inmate lottery has proven an effective way to advance story where necessary, but it hasn’t really made me care about the guard storylines enough to make the developments with Aleida and Hopper feel like a strong use of the show’s time. Not everything needs to have the same weight as Taystee and Cindy. Suzanne and Pennsatucky turning into their own CBS cop show was a fun diversion, and I continue to love what Uzo Aduba is doing performance-wise in the utopia of Florida. It’s a good way to fill time in a season with—as I’ve mentioned previously—a distinct fireworks factory feel, where we learn the season’s climaxes (Taystee’s trial, the kickball game, Carol and Barb’s showdown) early on and know we’ll be waiting a while until we get them. But too often, the stories the show chose to build this season have run out of steam: Ruiz’s search for God felt rushed and haphazard, and Beth the Babykiller’s admission of guilt was the first time I’d thought about her near-drowning in a while (although screeners mean it is more spread out for me than for most of you). The show never quite justified Maria turning into the leader of the riot, and Gloria is absolutely right that Maria deserves her extra time for what she did, and so I don’t necessarily know what the show wanted us to take from this story. And when you think about how that time could have been spent fleshing out Taystee’s trial, or Sophia’s decision, you realize the way the show’s decision-making in terms of story balance can wreak havoc this late in the season. I want to see how all these stories end, because the show knows how to use foreshadowing to promise a foreboding end, but for every story where I’m deeply invested there’s another where I’m downright impatient, and that’s a frustrating place for the show to live. Interesting choice to have Taystee so plainly point out Piper’s white privilege: she’s absolutely right, but it felt a bit on-the-nose, and a bit weird that she and Piper had no additional conversation about her trial or anything else while they ran into each other at the salon. I realize the morality of the inmate lottery is a key point of conversation, but Ginger just putting Barb and Carol in the same cell was crazy to me. Stuff like the kickball decision—where they realize the game could be great for points, and resist Badison’s attempts to get it canceled—is one thing, but this felt like a stretch to me. I do like the way the guard storylines bleed into others: Blake has his moment with Ruiz right after rejecting the inmate lottery, and McCullough misses the drugs Badison planted on Piper after we see her numbed by Alvarez’s depressing anniversary party. Plus, the hit on Carol is only stopped because it’s one of the guards who isn’t playing that’s stationed with Ginger. Those details work, and pay off the longer arc. The later this show gets into seasons, the less nuanced its villains become, as we see when Badison just goes full psycho after Piper took over as coach of the kickball team. It’s dumb Piper didn’t see this coming, and expected rational behavior, but I also feel like the show is losing the plot on Badison’s motivations a bit. It’s also completely stopped trying to make Duerte a thing, which I’m in support of if it sticks. It is still absolutely insane to me that the show has never explicitly acknowledged Morello’s cellmate’s name (it’s Adeola). They did this with Allison (remember Allison?) before, but outside of Nicky’s Miss Cleo nickname (which she rejects as racist, since she’s not Caribbean) she has never been referred to by her name. I don’t know if it’s the show making a comment on the dehumanization of the prison system or just an attempt to make my job harder, but I continue to find her great. Having written about a crime procedural for three years here at the site, I liked how the episode followed their rules: it’s never the first suspect, and there’s always some kind of clue you didn’t realize was a clue, as we see here when Red questions the origins of “bulltrue” before it becomes Frieda’s confirmation that Gladys was the woman Carol hired to kill her and was too stupid to hide her commissary windfall. If another inmate admits to trying to drown someone during a prayer meeting, shouldn’t there be a guard or someone who is like “uhh, that’s not okay?” Felt like we were missing a step. I’m really curious if they’d ever transport an inmate on trial and the fellow inmates testifying against them on the same bus like they did here. My instinct is no.